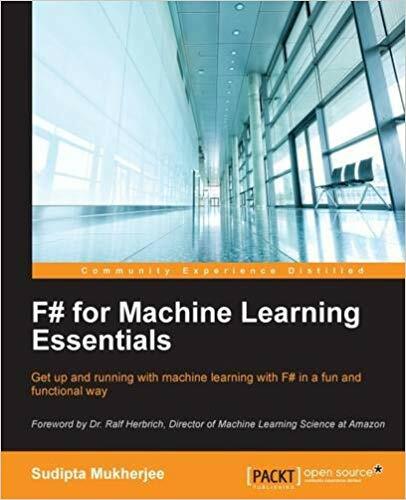 Get up and running with machine learning with F# in a fun and functional way About This Book * Design algorithms in F# to tackle complex computing problems * Be a proficient F# data scientist using this simple-to-follow guide * Solve real-world, data-related problems with robust statistical models, built for a range of datasets Who This Book Is For If you are a C# or an F# developer who now wants to explore the area of machine learning, then this book is for you. Familiarity with theoretical concepts and notation of mathematics and statistics would be an added advantage. What You Will Learn * Use F# to find patterns through raw data * Build a set of classification systems using Accord.NET, Weka, and F# * Run machine learning jobs on the Cloud with MBrace * Perform mathematical operations on matrices and vectors using Math.NET * Use a recommender system for your own problem domain * Identify tourist spots across the globe using inputs from the user with decision tree algorithms In Detail The F# functional programming language enables developers to write simple code to solve complex problems. With F#, developers create consistent and predictable programs that are easier to test and reuse, simpler to parallelize, and are less prone to bugs. If you want to learn how to use F# to build machine learning systems, then this is the book you want. Starting with an introduction to the several categories on machine learning, you will quickly learn to implement time-tested, supervised learning algorithms. You will gradually move on to solving problems on predicting housing pricing using Regression Analysis. You will then learn to use Accord.NET to implement SVM techniques and clustering. You will also learn to build a recommender system for your e-commerce site from scratch. Finally, you will dive into advanced topics such as implementing neural network algorithms while performing sentiment analysis on your data. Style and approach This book is a fast-paced tutorial guide that uses hands-on examples to explain real-world applications of machine learning. Using practical examples, the book will explore several machine learning techniques and also describe how you can use F# to build machine learning systems.